Ghostwatch: Behind the Curtains: We've got some lights... in the studio. Ducts wants to see everybody! The first Chasee to eagerly step up to the plate (or, is that, 'mark'... 'oche'?) 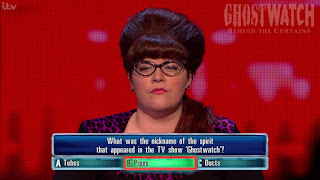 is Jon, who finds himself up against this episode's pre-selected Chaser; the formidably-horn rimmed, pink leopard print-lappelled, vampily-bouffanted, Jenny Ryan, otherwise known as 'The Vixen', for the chance to win as much as twenty-seven thousand grands, Eddie. "What was the nickname of the spirit that appeared in the TV show 'Ghostwatch'?" 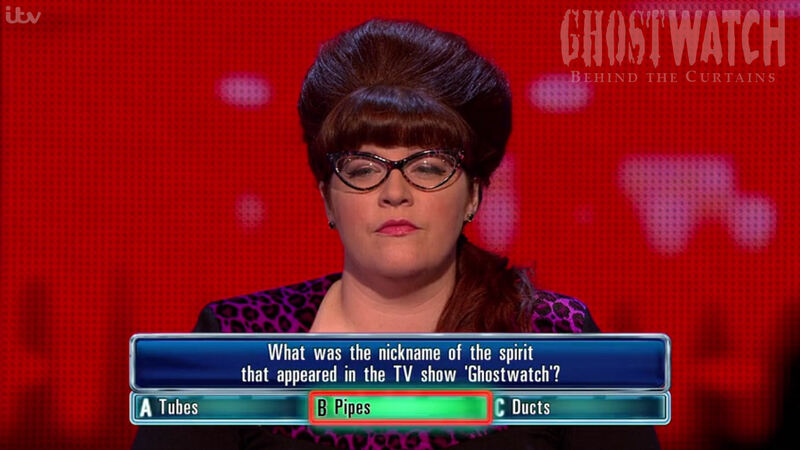 "A) Tubes" "B) Pipes" "C) Ducts"
"Now, I think, Ghostwatch was a spoof-ghost-documentary-thing that Michael Parkinson was involved in. And if it's that, Pipes rings a bell." 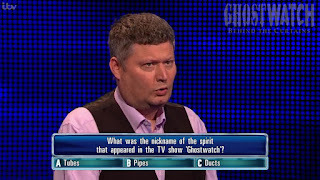 But seriously though, *rakish chortle*, the cherry on top simply has to be the revelation that Top-Quizzer/Chaser, Jenny, was spooked by Ghostwatch, ostensibly on the night of transmission. Aww. "Quite right. I'm still deeply traumatised by it. Because no-one told me it was a spoof. It was on Hallowe'en, in about 1992. It was terrifying." 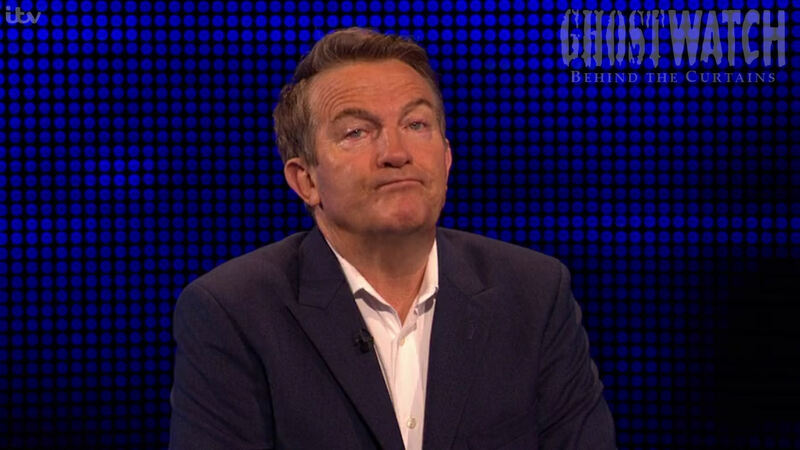 To which, dear old Bradders, slips the above glance to camera, which can best be described as enigmatically-ambivalent. On the off-chance that he's not internally-screaming to correct the repeated misuse of the word, 'Spoof'' in relation to yours and mine favourite special drama, can somebody please just lend him the DVD, in the hopes that he, like us, may do so in the future? 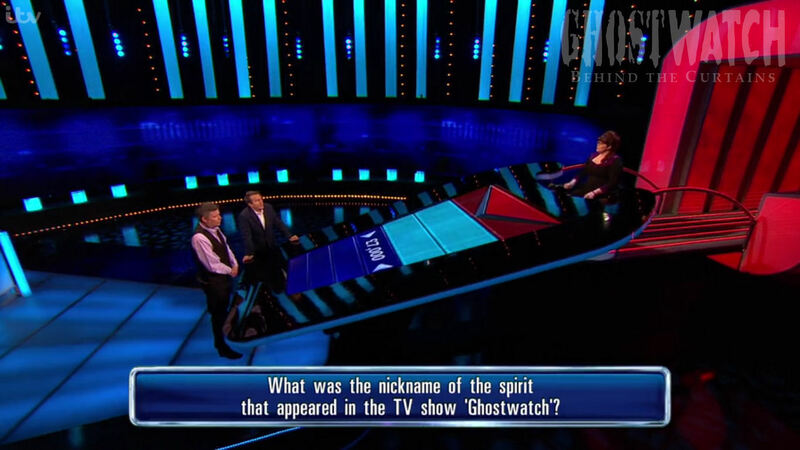 A huge thank-you must go to fellow Ghostwatcher, and all-round good guy, Paul Draper, for being the first to Tweet about this, and copying me in; at the very moment, no less, that I was having trouble taking a snapshot of my hastily-paused telly screen. Many thanks also to ITV, and their evidently, supremely talented, and well-versed, Quiz Question Quotations Department.